Tag Archive | "Old San Juan"
Look, up in the sky! It’s a bird! It’s a plane! Oh, it’s a kite! As spring turns into summer, and the skies begin to clear up, the time-honored tradition of kite flying returns to occupy open spaces all around Puerto Rico. The most popular spot on the island for this type of activity is the wide, open field of El Morro. The area around the historical landmark contains all the necessary conditions for successful kite flying in a picturesque setting: the sprawling green lawn, the unobstructed airspace (no power lines or aircraft), and the constant, unrelenting trade winds. With these characteristics, it’s no wonder why kite flying in El Morro is something every Puerto Rican family tries at least once. Picnics are commonplace with parents and children participating in the event; the terrain strewed with blankets, chairs and coolers, the sky dotted with simple or fantastical chiringas – as the flying objects are locally known. Kite flying is such a beloved leisure activity that the National Park Service has an annual Kite Festival celebrating the tradition, as well as raising awareness about the environmental repercussions we can avoid by being mindful of our surroundings. In fact, kite safety and etiquette are things you should familiarize yourself with before setting out. With the knowledge at hand, you’ll be able to better enjoy the experience. And what else do you need to enjoy the experience? A kite, of course! Kites are fairly simple to make right at home, so you can certainly turn your weekend into a full-fledged experience by making your own kite and proudly displaying your unique creation up in the sky. You can also bring your own store-bought flying sensation or buy one from the numerous street vendors (or the local pharmacy or toy store) lining the streets around El Morro and the Plaza del Quinto Centenario. Gayla is one of the most trusted brands for cheap yet incredibly sturdy and easy to assemble kites – and their classic designs like the ‘Baby Bat’ look great when displayed up above. Readily available in Old San Juan for less than five dollars, there is a lot of fun to be had on the cheap! Kite-flying season runs ostensibly from mid-spring to late summer and isn’t just focused on El Morro. Several other municipalities, like Fajardo and Lajas, celebrate the season with festivals of their own. 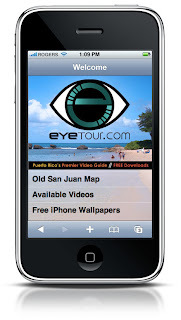 EyeTour.com is one of the media sponsors for the inaugural edition of the Taste of Rum International Rum & Food Festival to be held next Sunday May 24th, 2009 at El Paseo de la Princesa in Old San Juan. Join us for a day of Caribbean music, culinary treats, and of course, the best rums in the world! Prepare for the event by reading our featured article on Puerto Rica rum here. We’ll be covering the event and will feature it on an EyeCandy Photo Gallery update on our blog soon after, so check back for updates! Taste of Rum 2009 features a chance to experience a wide variety of Caribbean rums, great food from our neighboring islands, live music, and, last but not least, a feast of Puerto Rican joyful energy, culinary and musical richness, and culture! Features the unique experience of rum tasting with international and local rums, to be judged by a panel of rum experts and celebrities. The event will be held May 23rd & 24th at Hotel Casa Herencia.